Sunday was spent largely in the pool. My mom and niece came over and then a couple of friends. 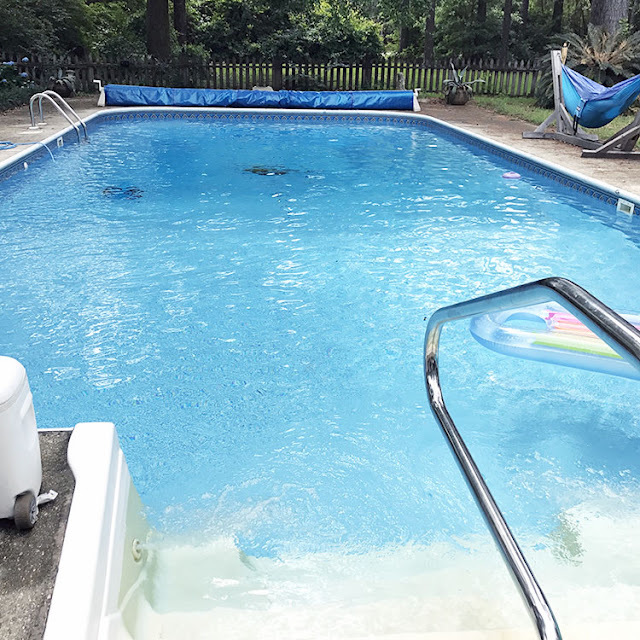 We do love our pool, and it's so nice to share it. Throughout the week, I did quite a few more paint pourings including some experiments on different paper types. The first two above are on canvas board and the third on cardboard. These are all still wet. I seem to really like their vibrancy while wet. I think sealing them somehow will help bring back that vibrancy while dry. I also tried acrylic pouring on a piece of tin. I sanded and coated the tin in gesso first to help make sure the paint would stick well. What did I do with all these experiments? I used many of them in my 100 Day Project for the week. 55: This was part of one I poured on posterboard. I sealed it in a bezel with a thick layer of resin. There were a few bubbles in the resin so I applied the butterfly rub-on to cover them. I also added fine glitter before sealing with another layer of resin. 56: For this one, I used a paintbrush to pick up some of the paint that had dripped off a painting. I applied the paint to the inside of the tiny bezel, let it dry, and sealed it with resin. 57: Another bezel project. This time, I peeled up some of the dried paint from the cookie sheet I was using to catch it. I cut the dried paint down and sealed it in the bezels with resin. 58: I took the rest of the painted posterboard (from day 55) and let the painting poke through as I altered it into a picture of flowers in a vase. 59: Using tin that I textured with dimpling pliers, I tried to pick up overflow paint. Once the paint dried on my tin, I cut it into a circle shape, hole punched it, and sealed it. 60: The process here was similar to the previous day but I didn't texture the tin beforehand. Instead, I waited until the paint was dry before texturing it in an embossing folder. I sanded, cut the teardrop shapes, hole-punched, and sealed the pieces. 61: I think this was my most successful of these last three attempts. This was from the large tin piece I poured the paint onto. I simply cut out the shapes, sanded the edges, and sealed them. 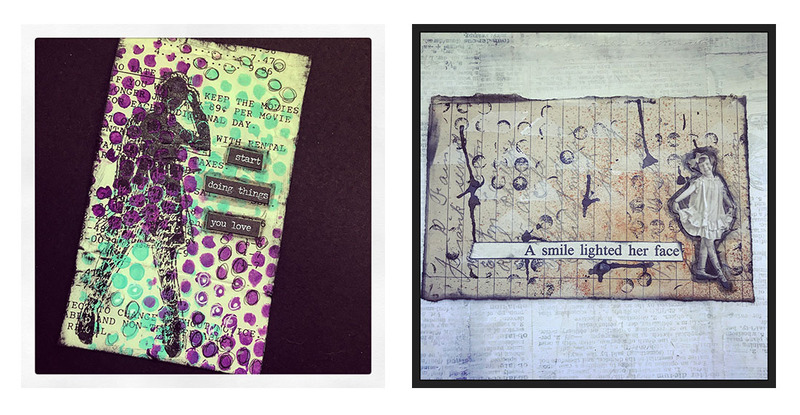 In addition to The 100 Day Project, I've decided to jump in on Daisy Yellow's Index Card a Day (ICAD) project. I tried juggling these two last year and had a little trouble. I can see that being the case next week when I go out of town, but I can always try to catch back up if I get off track. ICAD2018 started on June 1st and runs for 61 days (through July). Here are the two I started off with. There are prompts and themes that go with the ICAD project. However, there's no requirement to use them. They are just there to kickstart your inspiration if you work better that way. All the information can be found on the Daisy Yellow blog. 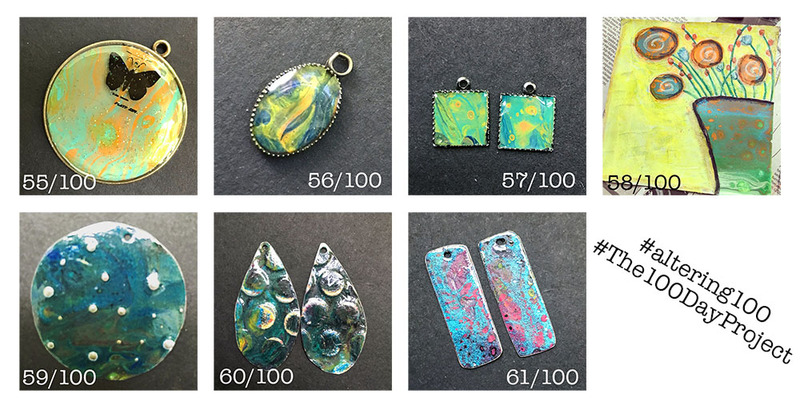 And, you can see loads of these icads on Instagram by searching #dyicad2018. It's still early, you can totally play along and catch up! There were animal shenanigans. Leeloo's still obsessed with paper. Right now all our toilet paper is under lock and key. Sigh. I caught Zoe with the ball in her mouth. It tickled me so much. And, there's Leeloo herself attempting to climb the window. Ha! 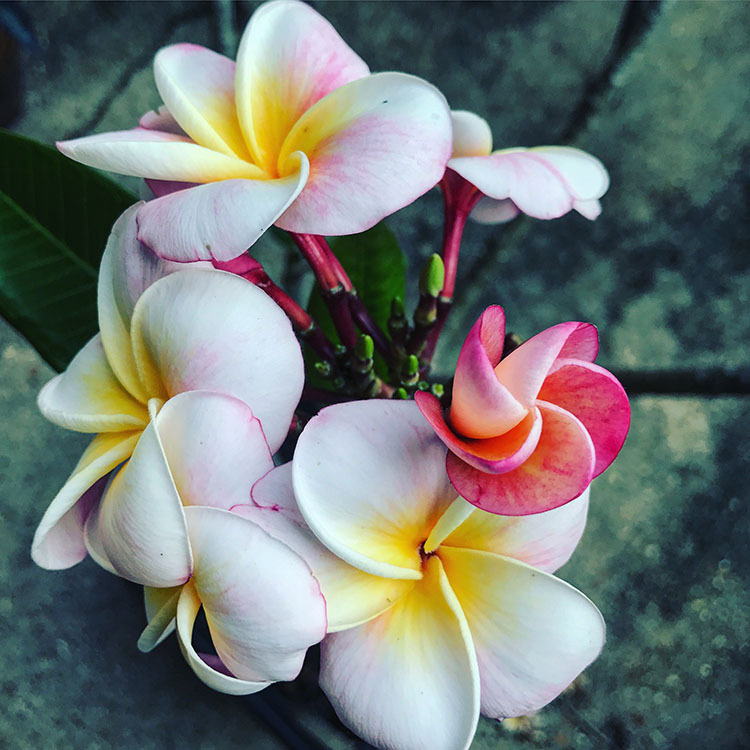 My mom's plumeria bloomed into this majesty. So beautiful! Oh, and I'm having a sale in my booth at Southern Antiques and Accents in Fairhope. 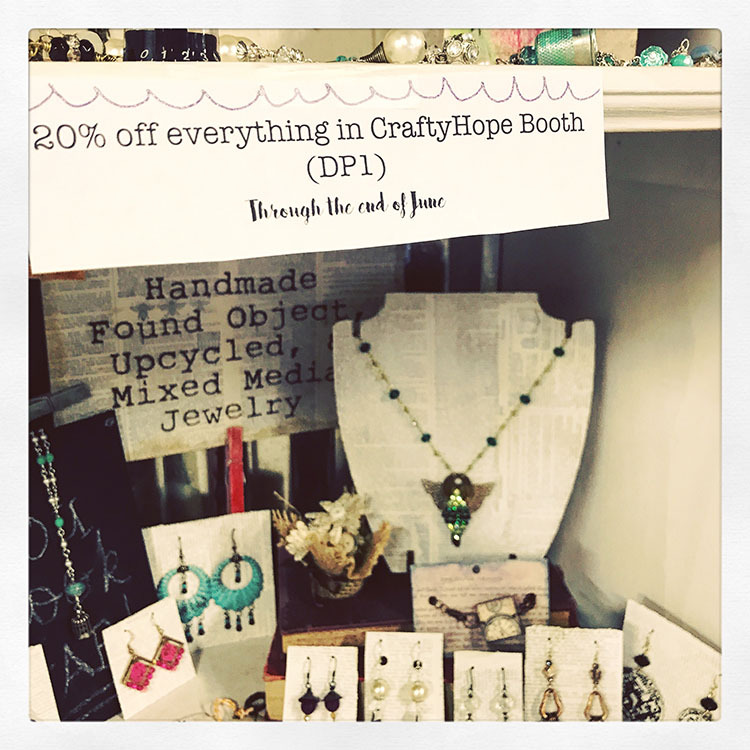 It's 20% off everything in the booth for the whole month! If you're in town, go check it out!! I mentioned last week that I was going to also share some of the links I find. Here's what I found interesting this week. The IndieCrafts blog shared a list of Top Mistakes to Avoid When Selling Your Crafts Online. Beadaholique offered a live class on June 1 on Displaying and Selling Your Handmade Jewelry. Since the date has passed, the link will take you to their video on YouTube. There's something so simple and so inspiring about the textile art of Tammy Kanat. And, here's just a cute little video of a penguin chasing a butterfly to make you smile. Pool, naughty kitty and silly looking puppy and crafting - what a great time you've had! Love your acrylic pour experiments and that you're taking them further by making jewelry with them! This is a fantastic idea! Rosantia, Every week is a new adventure for sure! The 100 Day project I set for myself was intended to have me think outside of the box and push some boundaries. The acrylic pour experiments are a perfect example of that. Of course, I do have to admit that it was my husband who asked if I could pour onto tin. He's so smart! I knew I married him for a reason ;) Ha! So glad you like the idea too. I just need to find a sealer I like. The one I used wasn't optimal and took forever to really set. Of course, that could just be the humidity here. But, more experiments is always fun too. Lorraine, That's so crazy to do that, but she must love them! Yes, they are weirdly alien before the leaves emerge. As for wasteful, I'm really only trying with old paints I want to use up or cheap-o paints. I've also been working on finding ways to use the overflow. So, there's that!